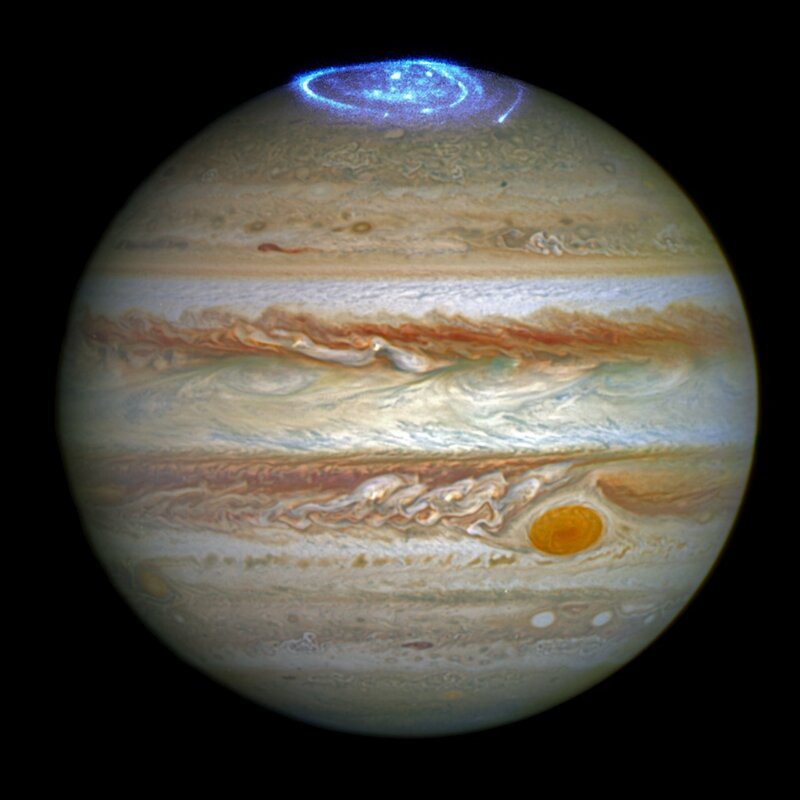 Jupiter has often been referred to as the King of Planets, and for good reason, as it is a massive gas giant, much larger than Earth and the largest planet in our Solar System. 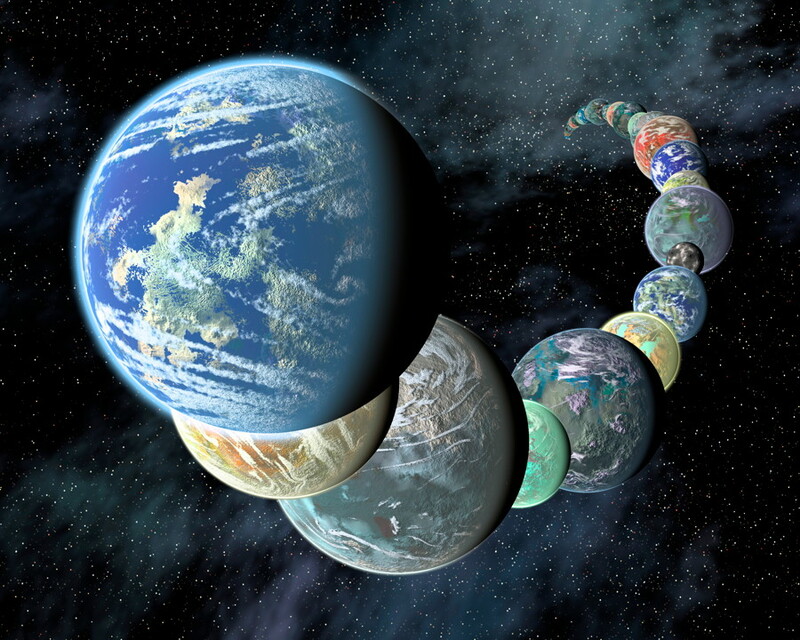 It is more than 2.5 times as massive as all the other planets combined, and is a mesmerizing world of colourful bands of clouds wrapping around the globe, which can be seen even in a small telescope, but exhibit incredible detail when seen by spacecraft. Jupiter is also itself the center of a sort of miniature solar system, with dozens of moons orbiting around it. 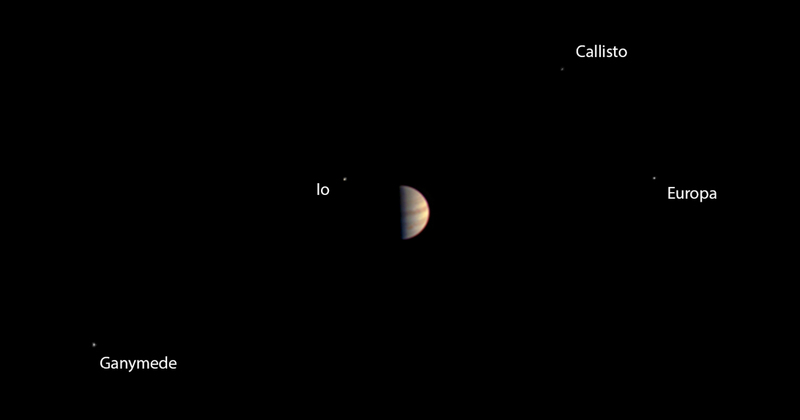 We’ve seen this world up close before by spacecraft such as Voyager and Galileo, but now a new visitor has arrived in the Jovian system: NASA’s spacecraft Juno. This phase of the mission is the most dangerous and nail-biting, due to the intense radiation belts around Jupiter, also the strongest of any of the planets in our Solar System. The charged particles travel at nearly the speed of light, making them very dangerous for any spacecraft. 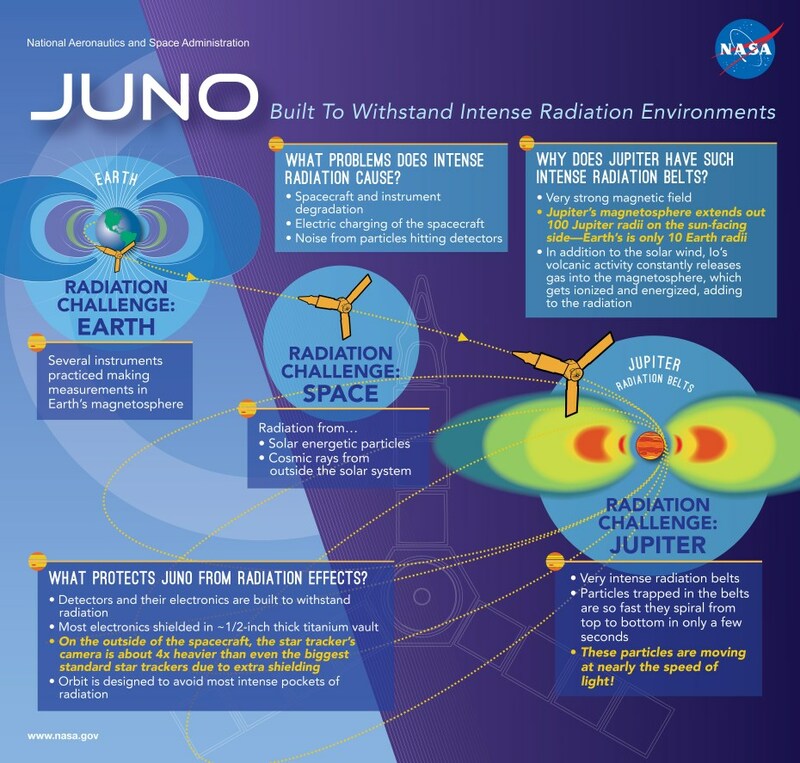 Juno will orbit closer to Jupiter than any other previous spacecraft, within 3,000 miles of the cloud tops, and is designed to withstand the radiation by dipping in and out of the belts, but it is still a risky maneuver. 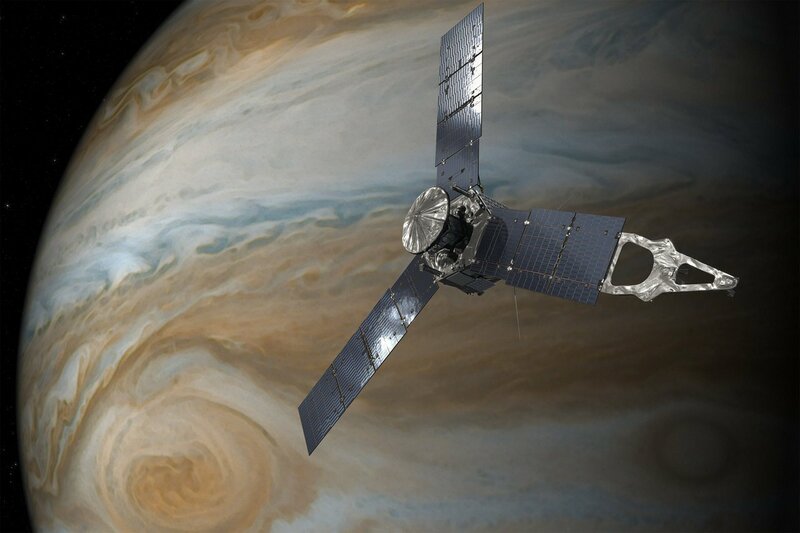 Juno will circle Jupiter in a long, elliptical polar orbit. In order to enter that orbit, Juno fires its main engine for 35 minutes to slow it down from its previous speed of 209,000 kph (130,000 mph), relative to Jupiter. That speed is about 265,000 kmph (165,000 mph) relative to Earth. 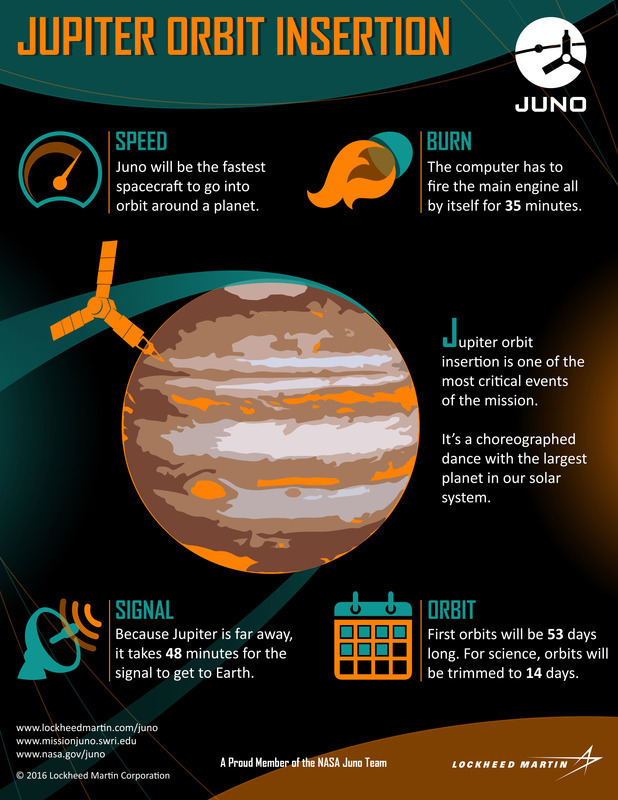 To give a better sense of that speed, Juno could circle around the entire Earth in only nine minutes. The delay in the radio signal returning to Earth from the spacecraft adds to the nail-biting suspense, since it takes 48 minutes for it to come back all the way to Earth.